NeoPixel Clock with 120x LEDs « Adafruit Industries – Makers, hackers, artists, designers and engineers! 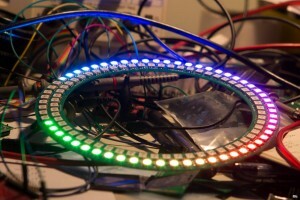 The clock is comprised of 2 rings of 60 LEDs each. the LEDs are WS2812 parts, which include a built-in driver. The PCB is one of the interesting parts of this clock. I designed the board in altium as a single 6 LED segment. and then left pads at each end to allow them to be soldered onto another segment.